Many of us are looking to provide continuing education for our WordPress clients, customers, and even friends and family at times. But let’s be honest, if you’re a designer and/or developer then you might not feel like educating your clients and customers is the best use of your time or that you’re very good with doing that at all! So you’ll either hire someone to provide that continuing education or bite the bullet and spend a few hours teaching them stuff that might actually make you pull your hair out. 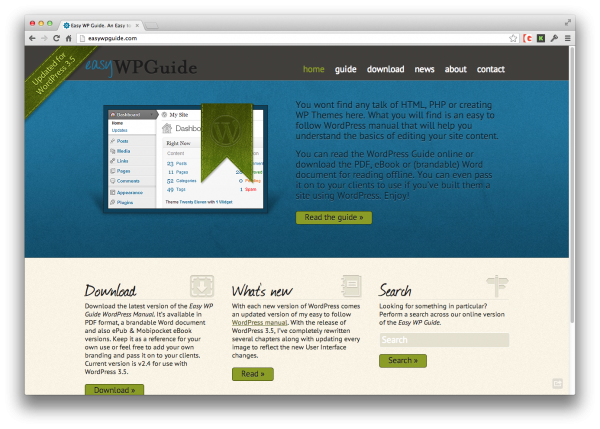 Easy WP Guide is a simple (yet effective) and free WordPress manual that you can give to your clients and customers so that they can learn what it takes to run a WordPress site. But the best thing (besides being free) is the fact that the author has put a Creative Commons license on it and even allows contributions from others to make it even better. So it’s an open source project as well! Thanks Anthony Hortin for making this available to the public and for saving us all countless hours! You rock!